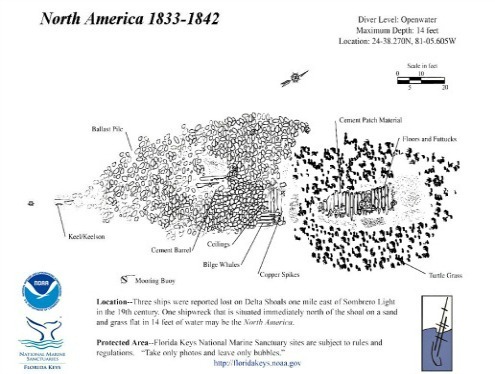 The North America Shipwreck is one of the interesting ships chosen to be on the Florida Keys National Marine Sanctuary Shipwreck Trail. Without her identity being fully confirmed, it's believed she's the 130 foot long, 29 foot beam, vessel christened the North America. This ship was a 2 deck, 3 masted, square rigged vessel built in Maine in 1833. On November 25, 1842, while en route from New York to Mobile, Alabama she grounded on a Florida Keys coral reef north of Delta Shoal. Captain Hall, her crew, along with the furniture and dry goods she carried were later safely rescued by salvagers. Resting in 14 feet of water, what's left of this Florida shipwrecks remains cover a 112 foot long by 35 foot wide debris field. The remnants are primarily nestled in sand, surrounded by an assortment of sea grasses. When Florida Keys diving th3 remains of this sunken ship, you'll notice that stone ballast makes up the largest portion of the wreck site. Her ballast also primarily lies within what's left of her wooden hull. This pile stretches about 85 feet in an oval shaped pattern. Most of her keel is buried beneath the ballast, but at the southwest end of the pile, a portion of her keel and iron drift bolts are visible. In the middle of the debris pile is a cement barrel and another barrel can be seen at the north end. At the southeast end of the pile are some pieces of ceiling lumber, copper spikes and pieces of cement used to patch the materials together. Further to the east surrounded by turtle grass you'll encounter more cement patch material and pieces of timber. The Shipwreck Trail has a variety of scuba diving sites that ranging from novice to advanced diving certification. This selection gives anyone scuba diving Florida Keys a chance to explore some of the more interesting and historic shipwrecks within the Florida Keys National Marine Sanctuary. All of these shipwrecks are protected, and a strict look don't touch policy is enforced. Choosing to visit this well marked Florida Keys diving site on the Shipwreck Trail, gives scuba divers of any certification an opportunity to enjoy not only the features of this wreck, but the benefits of it's proximity to other great Florida Keys dive sites. One of this wreck diving sites first perks is it's shallow depths and clear water. This creates the perfect environment for underwater photography and for those interested in Florida Keys snorkeling. Second, being at the north end of Delta Shoal and close to the Ivory Wreck, choosing to scuba dive here makes it possible to explore other close by and unusual Florida Keys diving sites. 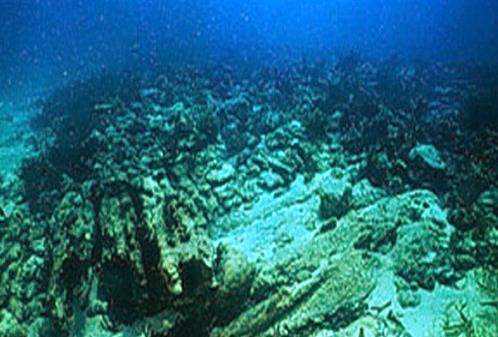 Third, the North America shipwreck is only about a mile to Sombrero Reef and Light. This is one of the more exceptional Florida Keys snorkeling and dive spots known for it's coral and varied marine life. Overall, you won't be disappointed if you choose to add the North America shipwreck onto your list of Florida dive trips to enjoy. Not only will you be able to examine the remains of this old vessel, you'll also find a variety of coral, juvenile game and tropical fish inhabiting the area. This combination is the key to a perfect scuba diving Florida Keys vacation that includes amazing underwater photography opportunities.